The forest owlet (Heteroglaux blewitti) belongs to the family of typical owls and owlets, the Strigidae. 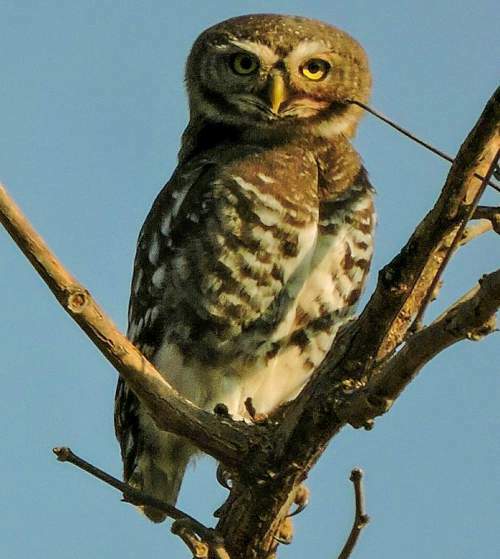 The forest owlet species is endemic to the forests of central India. These owlet species are listed as 'Endangered' by IUCN and are on the verge of extinction. These owlets are monotypic species. The forest owlet (Heteroglaux blewitti) is a comparatively small owlet, measuring 20 to 25 cm in length and weighing 240 gram. The upperparts are dark grayish brown. The underparts are whitish with dark barring. The facial disc is in shades of pale brown with fine barring. The crown and the forehead have faint, sparse pale spots. There is broad whitish supercilium. The upper breast is brown. The bill of the owlet is short and pale yellow in color. The irises are yellow. The feet are pale gray with powerful claws. Their call is a series of plaintive notes and also hissing and screeching sounds. This owlet species is endemic to the forests of central India. It is distributed in the states of Gujarat (Purna Wildlife Sanctuary), Maharashtra (Melghat Tiger Reserve, Tansa Wildlife Sanctuary, Satpura Mountains, Toranmal Forest Range) and Madhya Pradesh (Khaknar and Piplod Forests and East and West Kalibhit Forests). The Important Bird and Biodiversity Areas (IBA) of these owlets in India are, Melghat Tiger Reserve, Taloda Reserve and Toranmal Reserve Forest. These owlet species have high forest dependence. They normally occur in altitudes from 200 to 700 meters. The natural ecosystems and habitats of these species include, tropical and subtropical moist lowland woods, dense deciduous woodlands, open dry deciduous teak woods and tropical and subtropical dry forests. The diet of this owlet consists mainly of small vertebrates. Caterpillars, grasshoppers, lizards, frogs, small rodents and nestlings of other birds are their primary food. These owlets had been observed to hide their prey in the hollow of tree trunks. These birds are diurnal and have been observed to hunt during the day. They hunt from perches. The breeding season of these owlet species is from October and May in most of their range. The nesting sites of these species are hollows in softwood trees. These species are monogamous. The clutch usually contains two white eggs. The male hunts and feeds the incubating female. The nestlings are fed by the parents. The chicks fledge after 30–32 days and are dependent on the parents for further 40-45 days. These forest owlet species are non-migrant resident birds. The global population size of the owlet Heteroglaux blewitti is estimated to number about 250 to 999 mature individual birds. The overall population trend of the species is considered to be decreasing. In most of its range, this owlet species is reported to be scarce and rare. The generation length is 5.4 years. Its distribution size is about 55,300 sq.km. Habitat alteration and destruction, fragmentation of the habitats, deforestation, hunting and trapping for pet-trade are the main threats that are endangering the survival of this species. 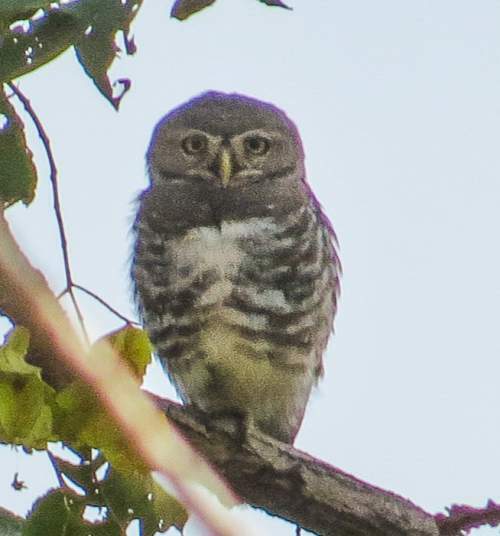 The owlet Heteroglaux blewitti has approached the thresholds for being Endangered under the range size criterion, under the population trend criterion and under the population size criterion. The IUCN (International Union for Conservation of Nature) has categorized and evaluated the owlet species and has listed it as "Endangered". 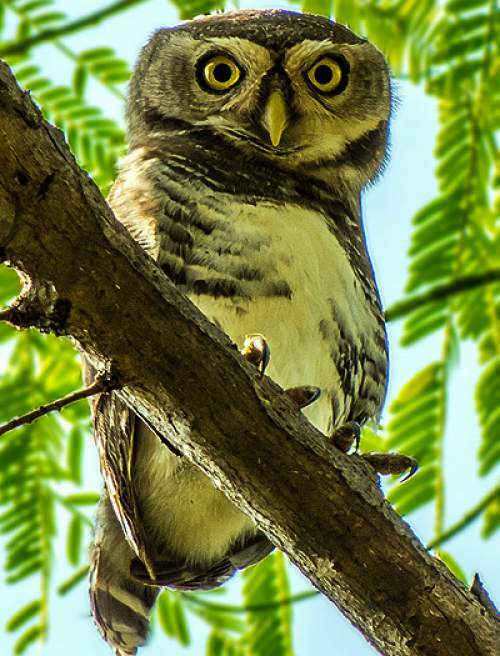 The CITES (Convention on International Trade in Endangered Species of Wild Fauna and Flora) status is ‘Evaluated’ for forest owlet (Heteroglaux blewitti) and is listed under Appendix I. The forest owlet (Heteroglaux blewitti) is closely related to the spotted owlet (Athene brama) and the little owl (Athene noctua). Some authors place this species under the genus Athene. Current topic in Birds of India: Forest owlet - Heteroglaux blewitti.